Illustrations note XXII, 574 p.
Building on the successful Analysing Ecological Data (2007) by Zuur, Ieno and Smith, the authors now provide an expanded introduction to using regression and its extensions in analysing ecological data. As with the earlier book, real data sets from postgraduate ecological studies or research projects are used throughout. The first part of the book is a largely non-mathematical introduction to linear mixed effects modelling, GLM and GAM, zero inflated models, GEE, GLMM and GAMM. The second part provides ten case studies that range from koalas to deep sea research. 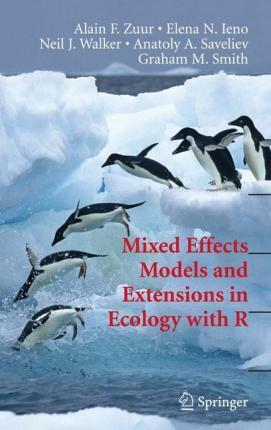 These chapters provide an invaluable insight into analysing complex ecological datasets, including comparisons of different approaches to the same problem. By matching ecological questions and data structure to a case study, these chapters provide an excellent starting point to analysing your own data. Data and R code from all chapters are available from www.highstat.com. Alain F. Zuur is senior statistician and director of Highland Statistics Ltd., a statistical consultancy company based in the UK. He has taught statistics to more than 5000 ecologists. He is honorary research fellow in the School of Biological Sciences, Oceanlab, at the University of Aberdeen, UK. Elena N. Ieno is senior marine biologist and co-director at Highland Statistics Ltd. She has been involved in guiding PhD students on the design and analysis of ecological data. She is honorary research fellow in the School of Biological Sciences, Oceanlab, at the University of Aberdeen, UK. Neil J. Walker works as biostatistician for the Central Science Laboratory (an executive agency of DEFRA) and is based at the Woodchester Park research unit in Gloucestershire, South-West England. His work involves him in a number of environmental and wildlife biology projects. Anatoly A. Saveliev is a professor at the Geography and Ecology Faculty at Kazan State University, Russian Federation, where he teaches GIS and statistics. He also provides consultancy in statistics, GIS & Remote Sensing, spatial modelling and software development in these areas. Graham M. Smith is a director of AEVRM Ltd, an environmental consultancy in the UK and the course director for the MSc in ecological impact assessment at Bath Spa University in the UK. Limitations of linear regression applied on ecological data. - Things are not always linear; additive modelling. - Dealing with hetergeneity. - Mixed modelling for nested data. - Violation of independence - temporal data. - Violation of independence; spatial data. - Generalised linear modelling and generalised additive modelling. - Generalised estimation equations. - GLMM and GAMM. - Estimating trends for Antarctic birds in relation to climate change. - Large-scale impacts of land-use change in a Scottish farming catchment. - Negative binomial GAM and GAMM to analyse amphibian road killings. - Additive mixed modelling applied on deep-sea plagic bioluminescent organisms. - Additive mixed modelling applied on phyoplankton time series data. - Mixed modelling applied on American Fouldbrood affecting honey bees larvae. - Three-way nested data for age determination techniques applied to small cetaceans. - GLMM applied on the spatial distribution of koalas in a fragmented landscape. - GEE and GLMM applied on binomial Badger activity data.